Owner at Bee's Knees Custom Designs in Anoka, MN. I was recently inspired by someone on Instagram and wanted to recreate the look and put my own twist on it. This dresser needed something bold since the original finish was so boring. I sanded everything and made a few repairs before I could continue with my vision. I taped off the appropriate areas and stained an upside down triangle shape with General Finishes Antique Walnut Gel Stain. I primed everything else with General Finishes Stainblocker before applying Antique White Milk Paint. Everything was sealed with General Finishes Flat Out Flat Topcoat to achieve a matte finish. I love coming across dressers and chests like these because you can do SO many different things with them. I wanted a more modern look for this vintage dresser, so I created a two-tone look and updated the hardware. I lightly sanded the body and drawers before I applied General Finishes Lamp Black Milk Paint and used General Finishes Flat Out Flat Topcoat. I lightly polished the legs to finish the look. Lately I have been stepping out of my comfort zone when it comes to painting. It started with creating a shade of green I fell in love with. Then I decided to do a colorblock pattern on a few dressers. I knew I wanted something bold so I decided to do something -- an asymmetrical two-tone. I refinished half of the drawers and the legs with a custom mix of General Finishes Antique Walnut and Java Gel Stain. The rest of the desk was primed with General Finishes Stainblocker before I painted the rest in Antique White. I thought the drawers for this dresser were a perfect candidate for something bold, like a colorblock. Unfortunately the dresser needed a lot of work before I could carry on with my vision. I rebuilt the top and sealed the body with General Finishes Stainblocker before painting it with Antique White Milk Paint. I used Lamp Black Milk Paint on the bottom drawers and refinished he rest of the drawers with Antique Walnut Gel Stain. I loved how it turned out and I can't wait to recreate this look again! This classic coffee table came to me wanting a classic color -- gray. I used one of my favorites grays, General Finishes Queenstown Gray Milk Paint, and created a timeless look that lasts for an eternity. This MCM lowboy needed something special because it had very unique hardware. I thought a colorblock would help make it stand out (in a good way). I used one of my favorite grays on the body, General Finishes Queenstown Gray Milk Paint. I painted the middle and bottom sets of drawers with General Finishes Antique White Milk Paint. The top set of drawers were refinished with General Finishes Antique Walnut Gel Stain. My only regret is not keeping this dresser for myself! I used to steer clear away from this MCM style until one day, I had a vision. This chest needed something BOLD. I used General Finishes Queenstown Gray Milk Paint on the body and colorblocked the drawers with General Finishes Antique White Milk Paint and General Finishes Antique Walnut Gel Stain. The body and painted drawers were sealed with my favorite sealer, General Finishes Flat Out Flat Topcoat. When I rescued this chest of drawers -- I KNEW it wanted to live again as a farmhouse-inspired chest. The vision came to me instantly -- a white body and refinished top. 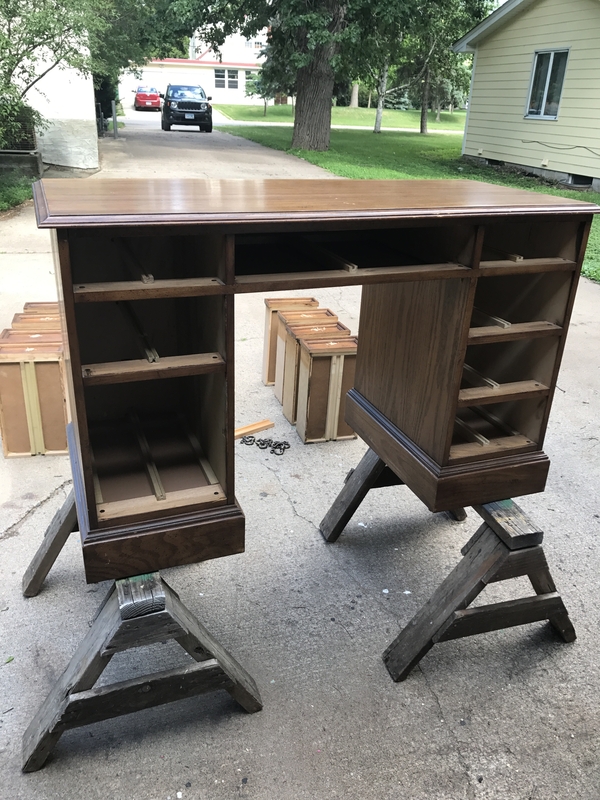 I refinished the top using a custom mix of General Finishes Antique Walnut and Java Gel Stain. I primed the body with General Finishes Stain Blocker and painted it with General Finishes Antique White Milk Paint. I used one of my favorite topcoats, General Finishes Flat Out Flat, to seal the body and drawers of the chest.